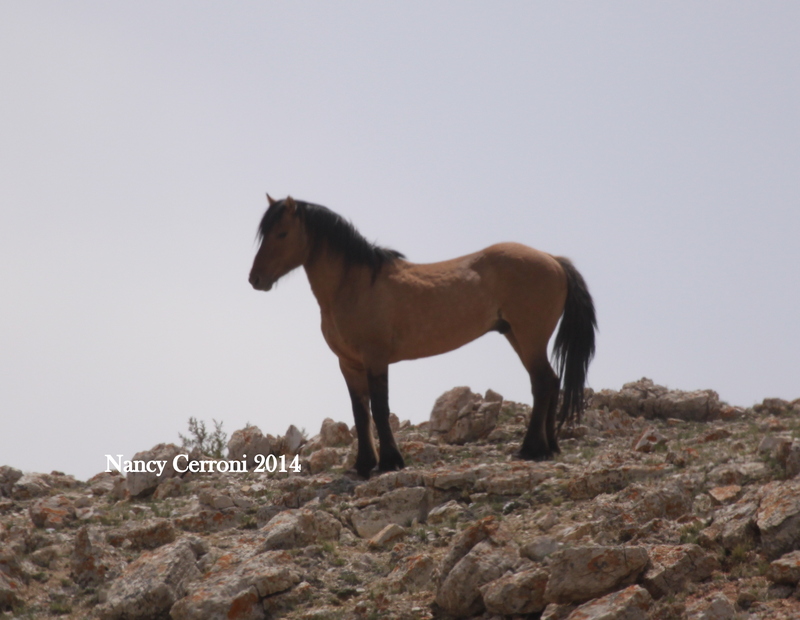 June 16, 2014 Update: We did see Nimbus on the mountain yesterday. She is still with the band of bachelors. Knight is working gallantly to keep Nimbus from London and Inali. Nimbus still has the black on her rear end and tail. The wound on her leg appears to be healing. 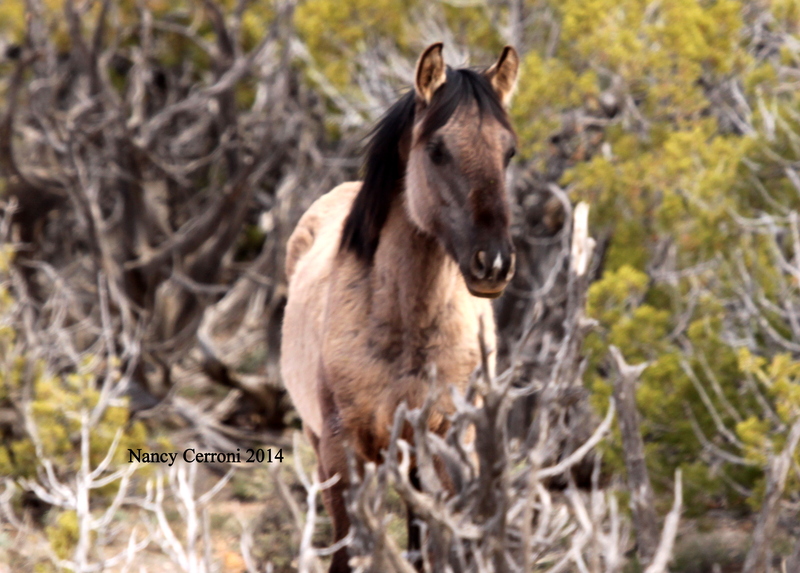 She is in a tough situation right now, a very challenging one for a yearling. However, she has good body weight and is grazing normally. 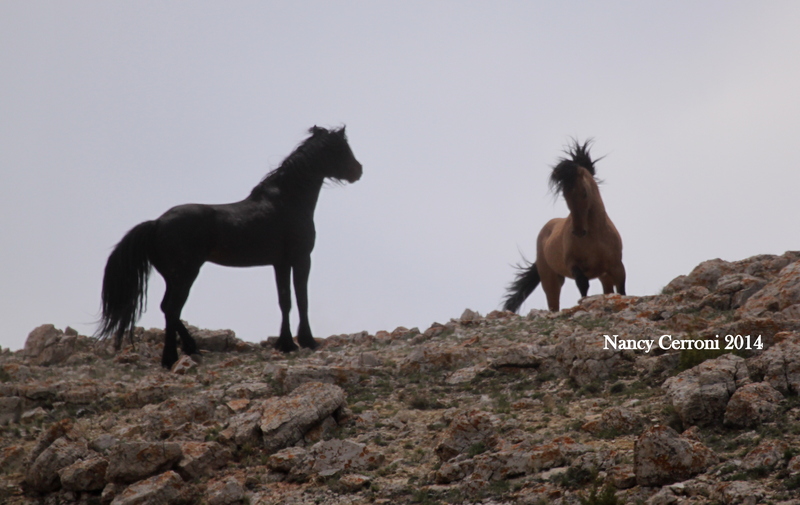 Lauryn and Rachel made a good comment yesterday…now that they are on the mountain with so many other bands, it would be good for Nimbus if a strong band stallion can take her into the protection of his band. 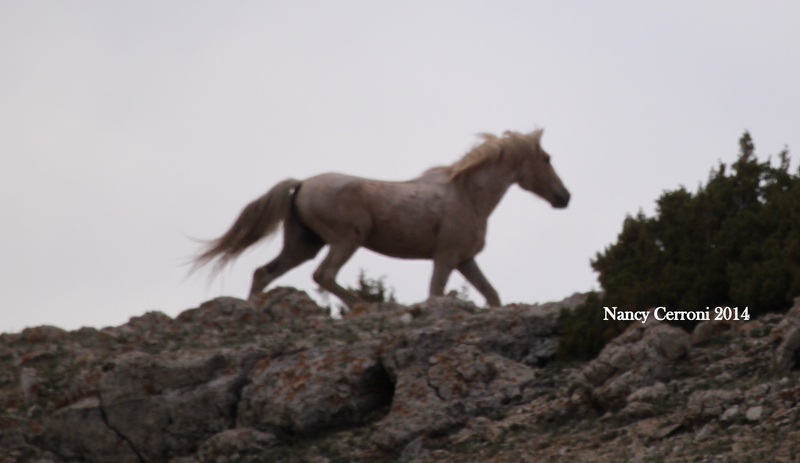 Many people have been asking about Nimbus after her separation from her family of Cloud and Feldspar. Just a note that Nimbus is one of the horses with two names. She is also known as Encore. 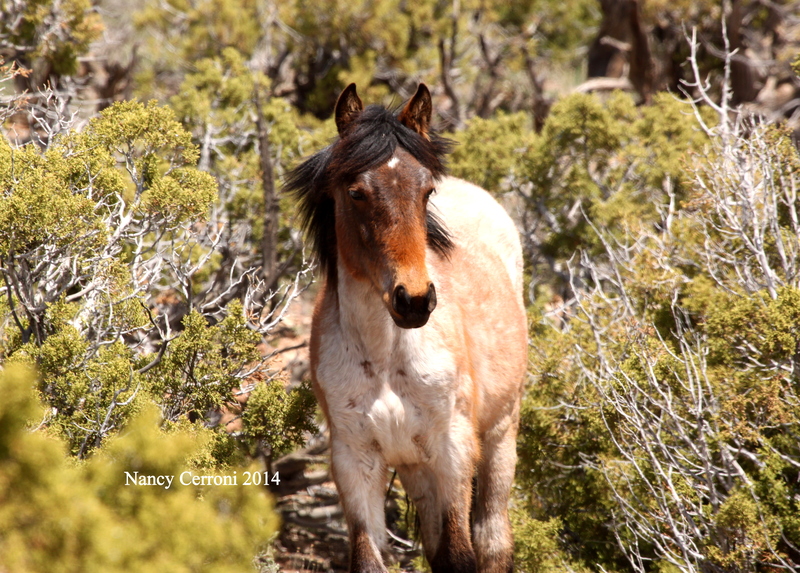 This new situation might not be an ideal situation, but she had found companionship with a young stallion, Knight. After first leaving her family, Nimbus did have some dark staining on her rear end. 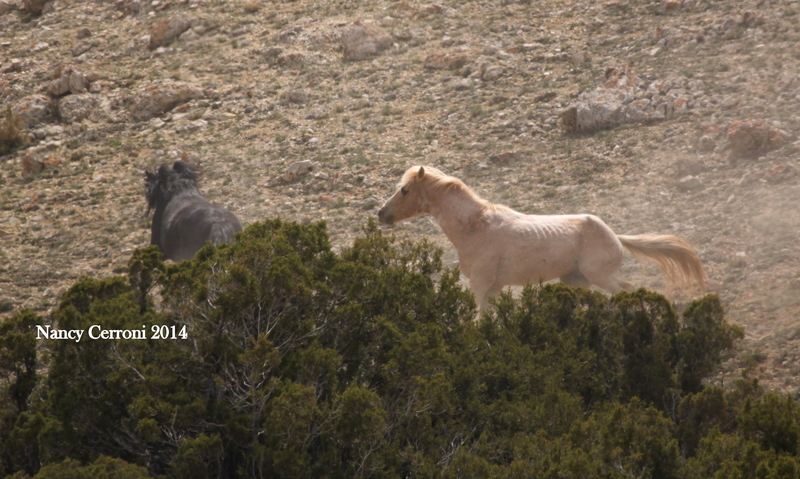 On May 25, 2014 she was back to her light palomino color with just her tail showing the dark stain. 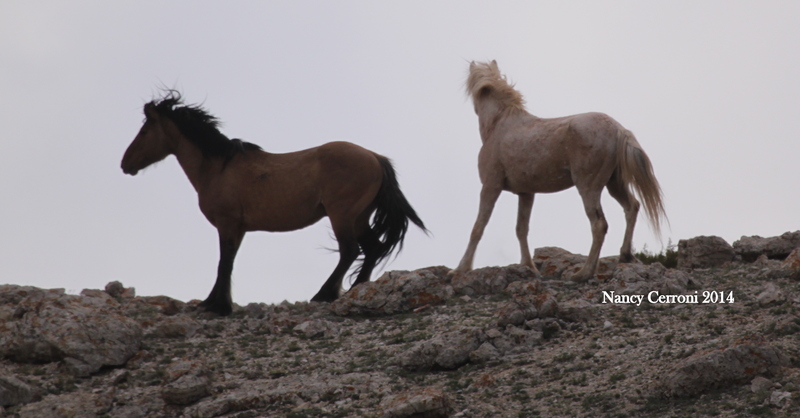 Nimbus and Knight were standing on a ridge with London and Inali right near them. The two other bachelors seemed to keep their distance. Nimbus seemed content enough to lie down and take a short nap with Knight close beside her. Nimbus wakes up from nap. There was not pressure on young Knight or Nimbus from London or Inali. Inali did have a brief altercation with Tecumseh who still faithfully dogs Gringo’s band. 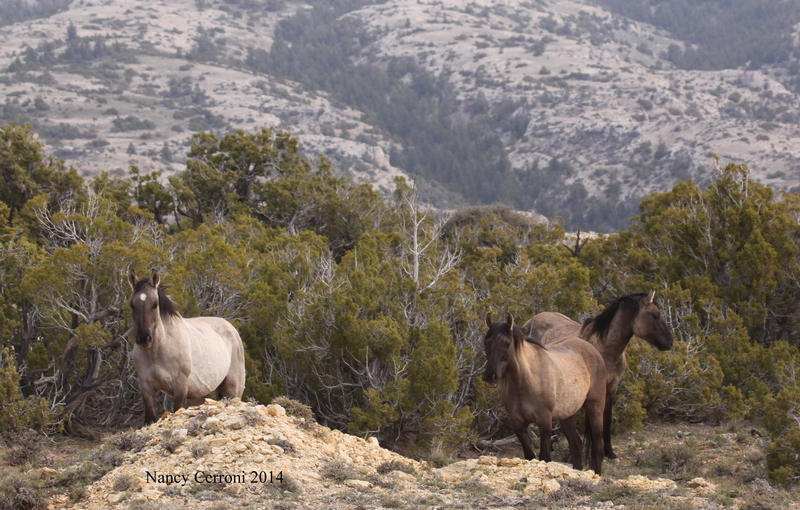 As we left Cheyenne Flats, the three bachelors and Nimbus grazed peacefully. Some stories have to write themselves in my head before words can go on paper. Such is the story of Jackson. 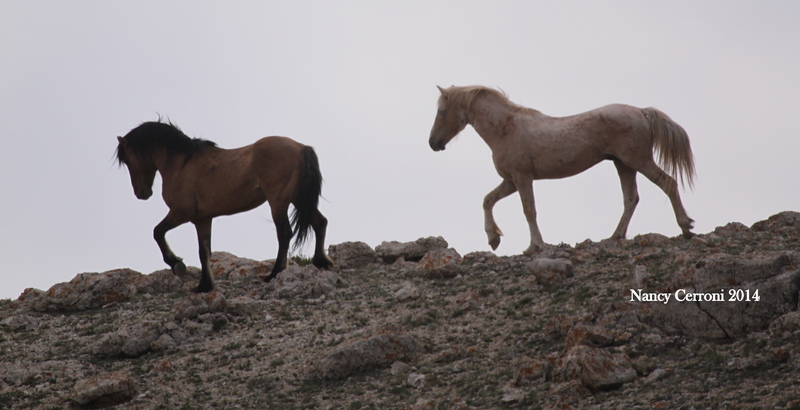 Recent events have taken Jackson from the band stallion of the largest group of horses on the mountain to a bachelor stallion. This is the way of the Pryors, a story line that is time eternal. However, some are more poignant because of the characters involved. Such is the case of Jackson and his band. This is not an easy story to tell. 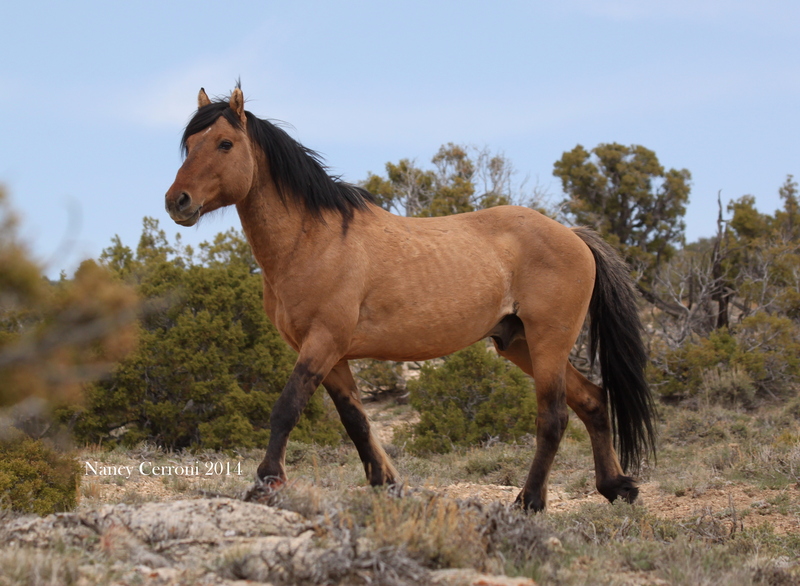 Jackson has been a long-time favorite of mine ever since I started watching the wild horses. In addition, the story has been tumultuous and complex, unfolding through time (and still unfolding). 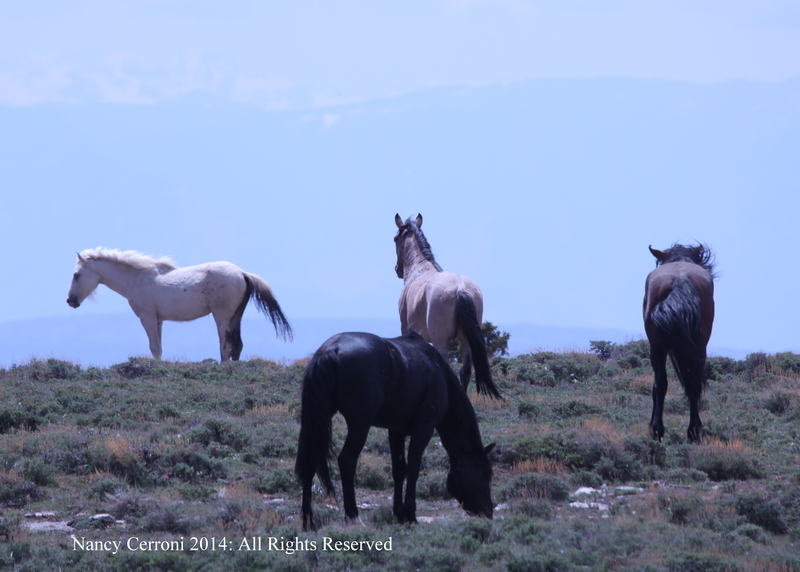 For this reason, this post has taken time to think through in order to capture it as one of the historic moments on the Pryor Mountain Wild Horse Range. We pick up the story on May 4, 2014. This was the same day as the epic battle between Cloud, Doc, and Cappuccino. 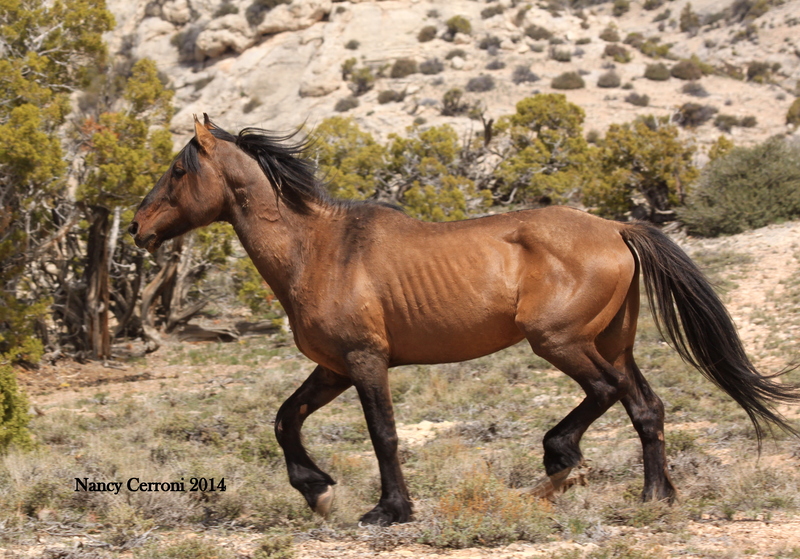 Jackson, now a 16-year old was coming off a tough winter as the lead stallion of a very large band. Jackson was thin and for today, he wisely stayed out of the skirmish below. Jackson’s band looked good that day. They grazed in a juniper area to the west of Chino’s Corner. 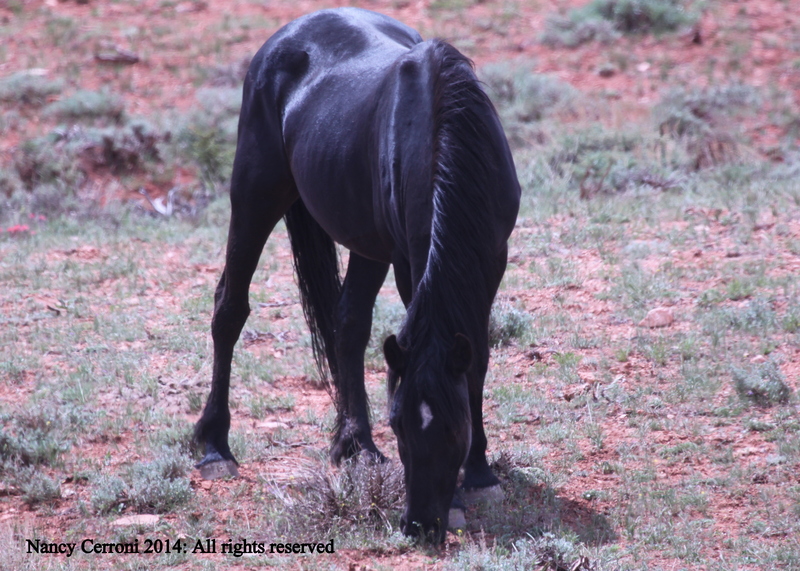 Brumby’s longtime mare, Brumby, grazed with her 2012 son, Moorcroft and mare, Aztec. 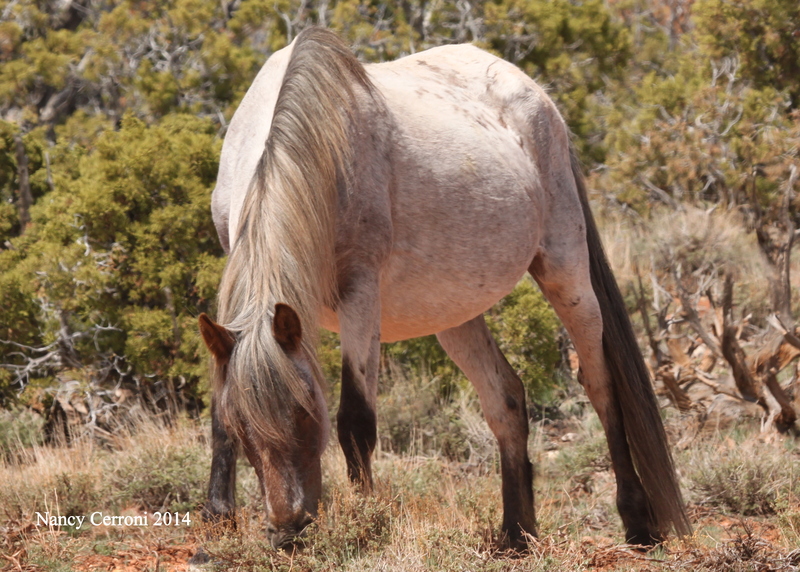 Aztec’s daughter, Jasmine, is a stunning blue roan mare. 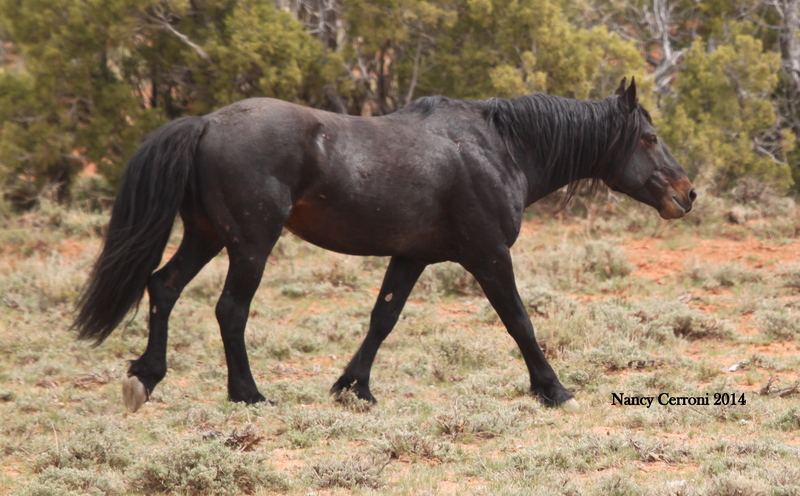 Mare, Firestorm, was quite large with her pregnancy. 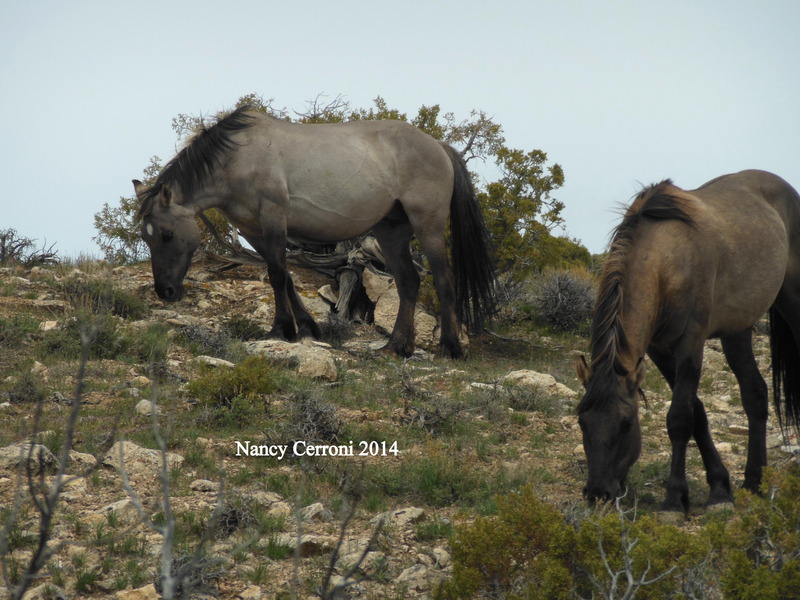 She, along with her colt , Maelstrom and daughter Niobrara, share a strong roan color pattern. 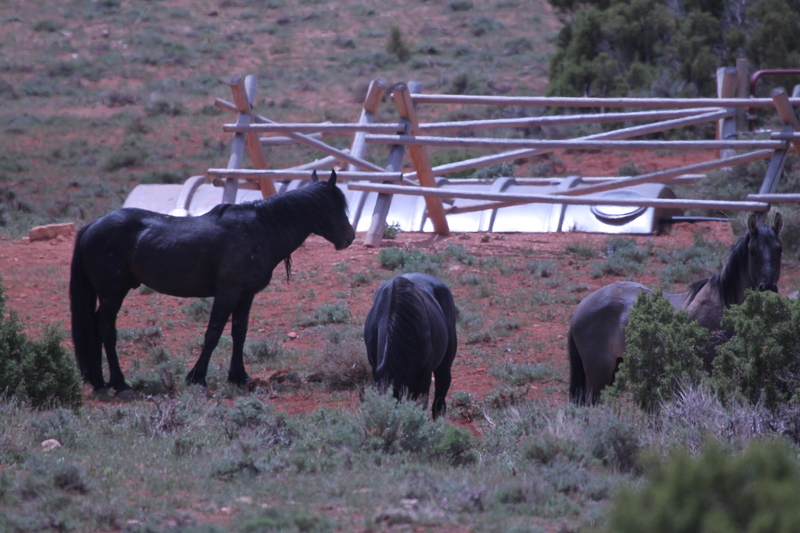 Also present is Galena, a beautiful black mare, and her 2013 filly, Nye. Beautiful Heritage watched the action below the band. May 10, 2014: Matthew and Kimberly took me on my annual birthday trip to the Pryors. 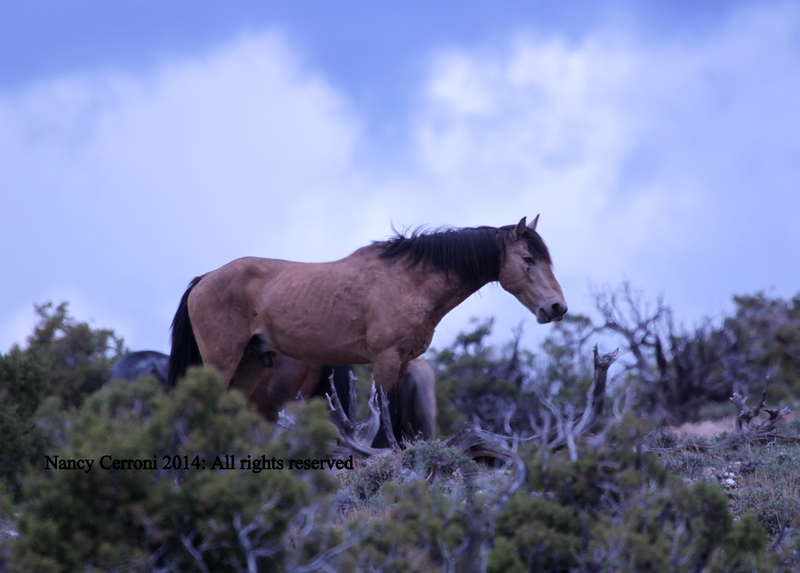 This year the trip had an added burden as we tried to locate Cloud after his battle with Doc. Towards the end of the day, we saw Jackson’s band grazing on the hillside just below the mines. It was a quiet time of grazing for the band. This is the day when I had the first hand knowledge that something had happened to Jackson’s band. 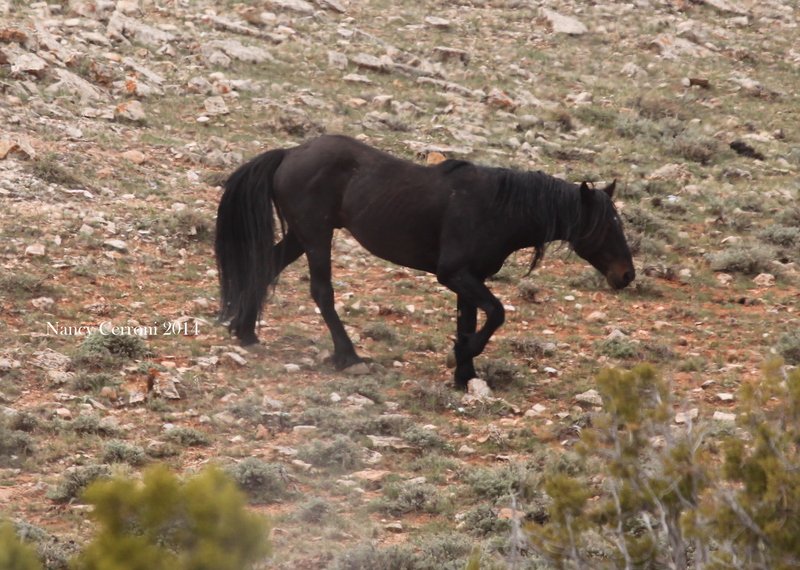 I spotted a dark bay horse with a pair of grullas. 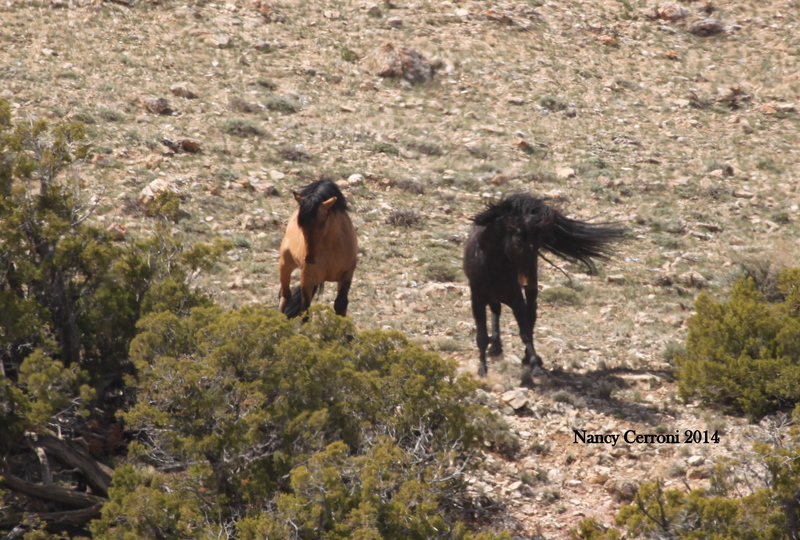 Walking nearer I could clearly see the tangled wind snarls of Doc’s mane. 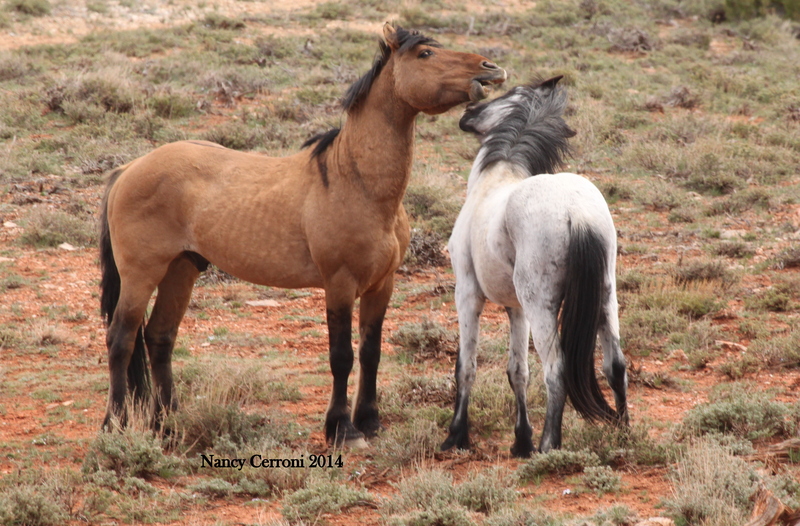 The grulla mare picked up her head and immediately it became clear that it was Brumby. 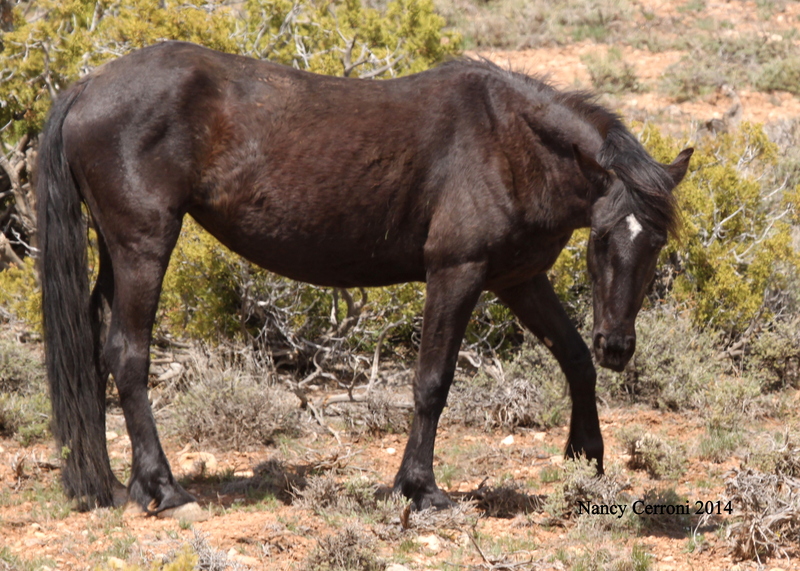 Brumby’s two-year old son, Moorcroft, grazed near his mom. Brumby without Jackson, just didn’t seem possible. At that point, there was no sign of the rest of the band…including Jackson. Brumby and Moorcroft. Doc is to the left of them. How had Doc gone from the band stallion of Cloud’s band to the leader of this new band? The next trip to the area was to say the least confusing and chaotic. Upon arriving, we saw that Doc was at the water guzzler with Brumby, Moorcroft. But there was one more horse. 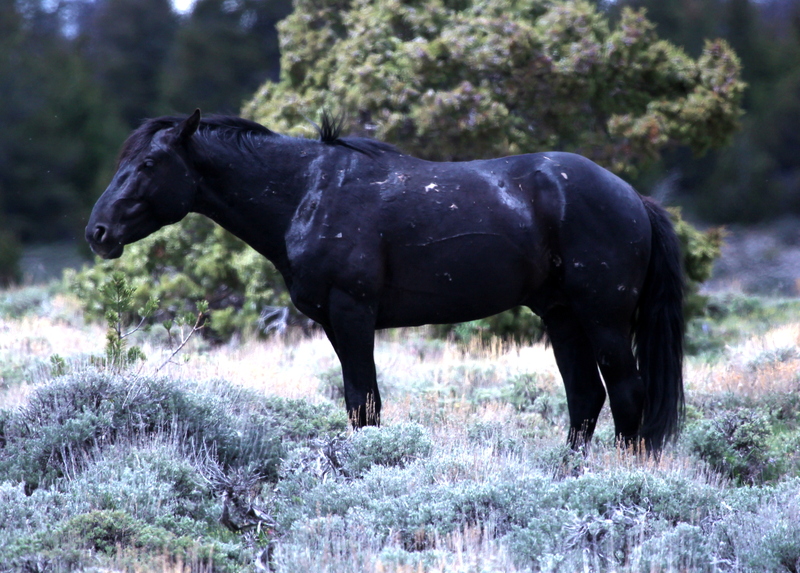 The familiar star on a black mare revealed the identity of Galena, one more of Jackson’s large band. 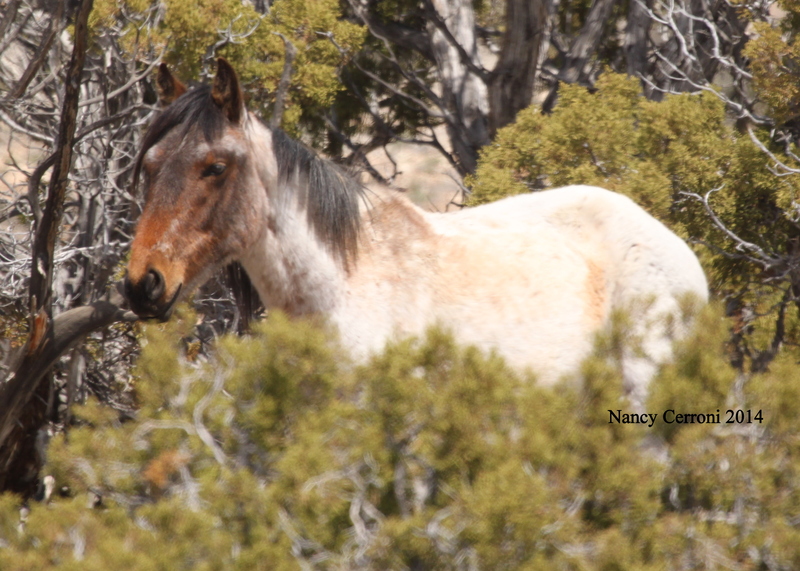 Chino, the aging buckskin stallion, was standing alert on the hillside above Doc’s band. Steve signaled us that there was another band up above Chino. A quick hike showed that Santa Fe was with the rest of Jackson’s band. There was no sign of Jackson anywhere. Santa Fe led his group down the hill towards water. As Santa Fe’s band walked down into the area near the water guzzler, chaos broke out! It’s hard telling what the catalyst was. It almost seemed like the mares wanted to join back together. After all, they had been together for a long time. Jasmine took off running towards Doc’s band. 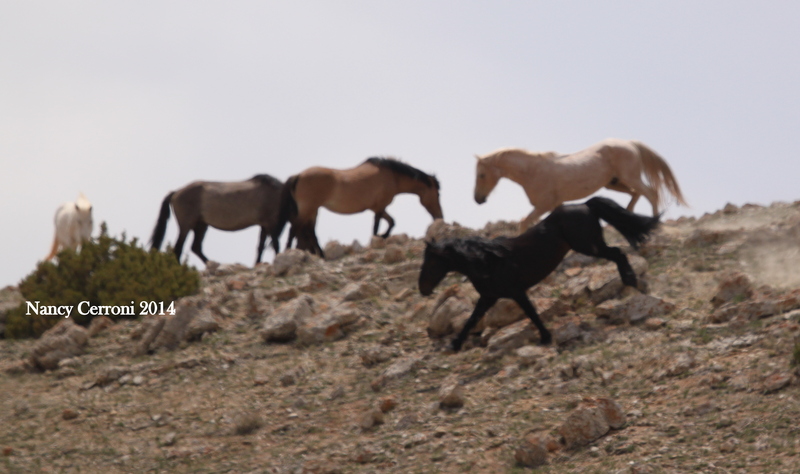 Santa Fe went into action and began snaking the mares and the young horses. Chino joined in by herding Firestorm, Maelstrom, and Niobrara. Chino joins in the chase. Doc’s band had settled in on a nearby slope. Santa Fe’s group nears Doc’s band and busts right through. And the whole group of horses is off and running again. 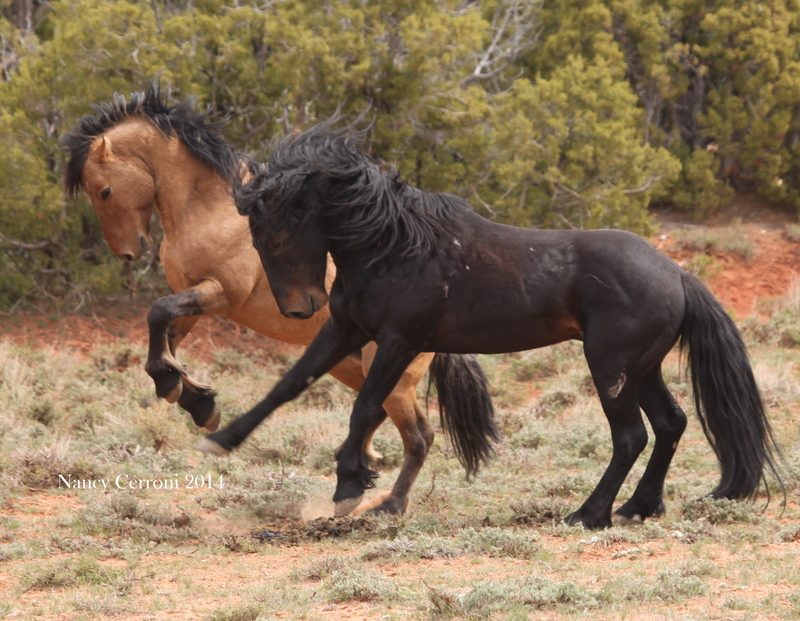 Santa Fe moves Firestorm and her offspring towards the south. Doc’s group cuts across the meadow. The bands are clearly dividing by this point. At the end of this day, Doc’s band consisted of Brumby, Moorcroft, Galena, Jasmine, and Heritage. Santa Fe was seen moving his band up the old road at the mines. Since that day: Ginger Kathrens has reported that she has recently seen Jackson. He is still not as robust as he has been in the past. Today he was down near Santa Fe and Chino. Santa Fe has lost his band. Firestorm is now with Doc. 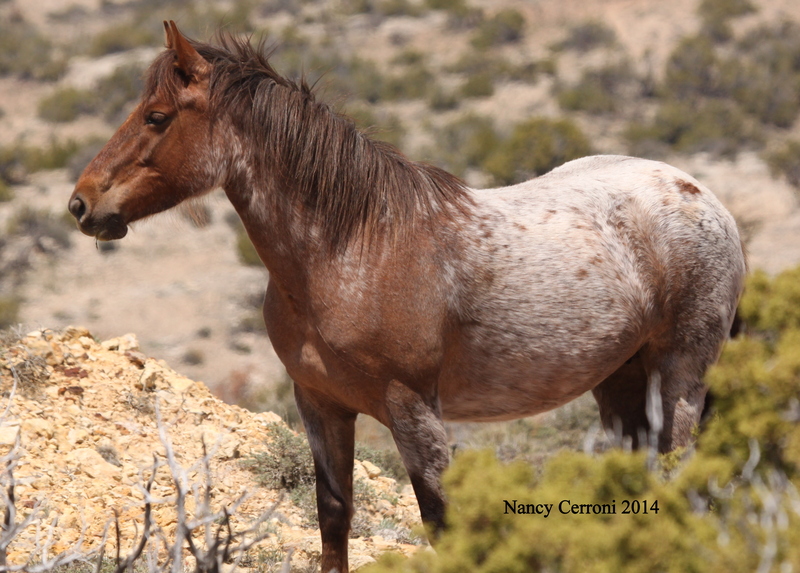 She has had her foal that Ginger describes as a beautiful dun colt that may be a coyote dun like Jackson. For that reason, she has asked to call him Okomi which means coyote in the Arapahoe language. 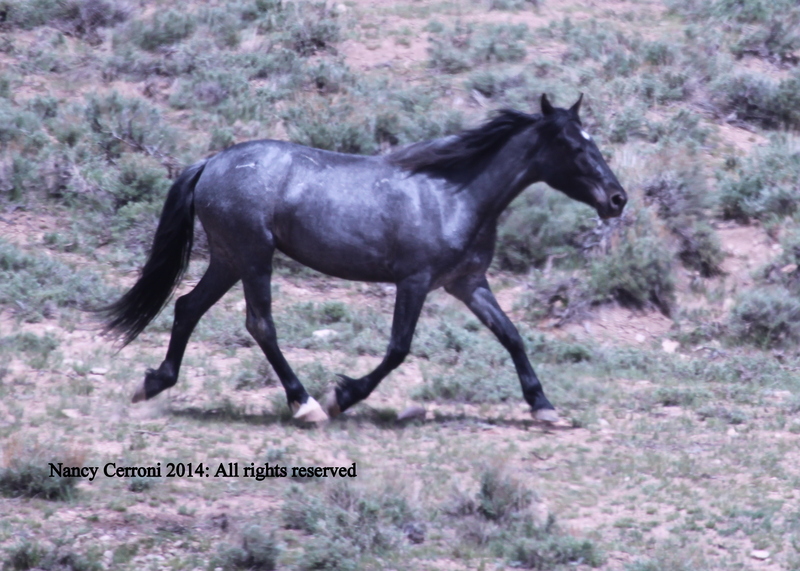 This is fitting for a Jackson offspring as the Northern Arapahoe are native to Wyoming. At this point, all members of Jackson’s band are not accounted for. We will be heading up this weekend and try to find each one. In addition, we will keep watch on Jackson and the rest of his band. Life on the Pryors is harsh. My husband, Steve, helps me through the tough times with this saying, “Love them enough to let them be free.” And how true is that? Epic: Very great or large and usually difficult or impressive. The word, epic, truly defines the series of events on Sunday, May 4, 2014. 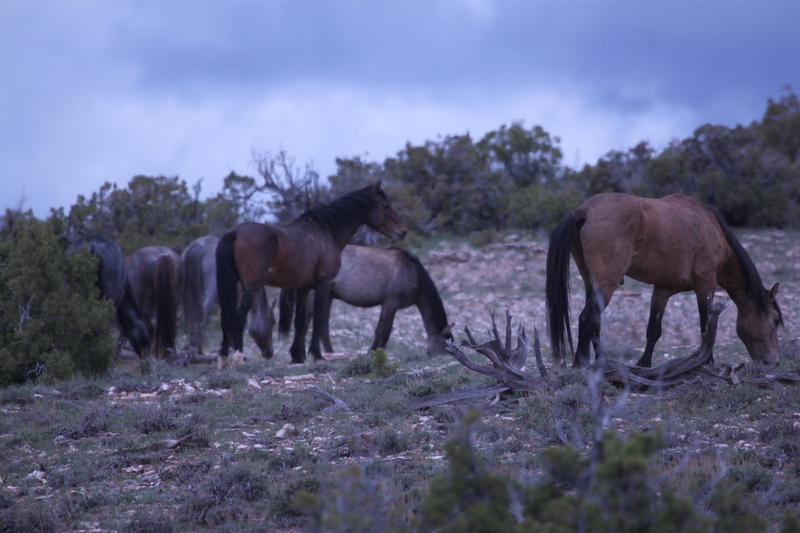 One of the goals of the PryorWild blog is to capture the historical events of the Wild Horse Range. This is one such event. Upon arriving at Chino’s Corner. 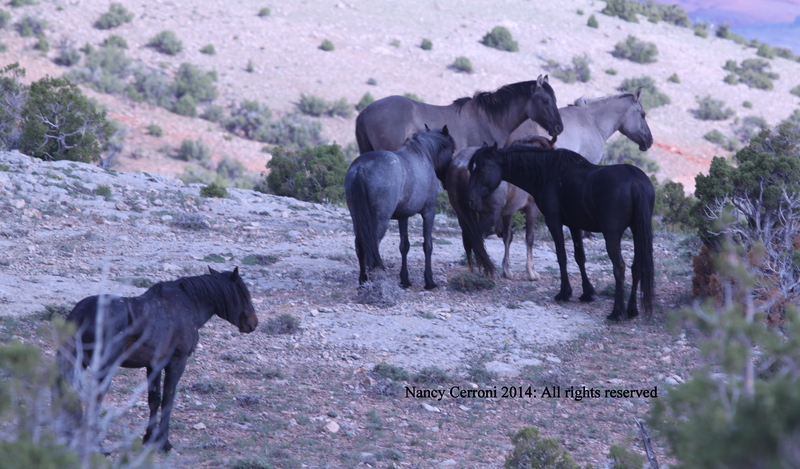 Horses were visible to the east of the water guzzler, grazing on the side of the hill. It’s not hard to identify a band with the easy visibility of Cloud and Nimbus’ light coloration. A dark horse was standing guard just to the west of Cloud’s band. 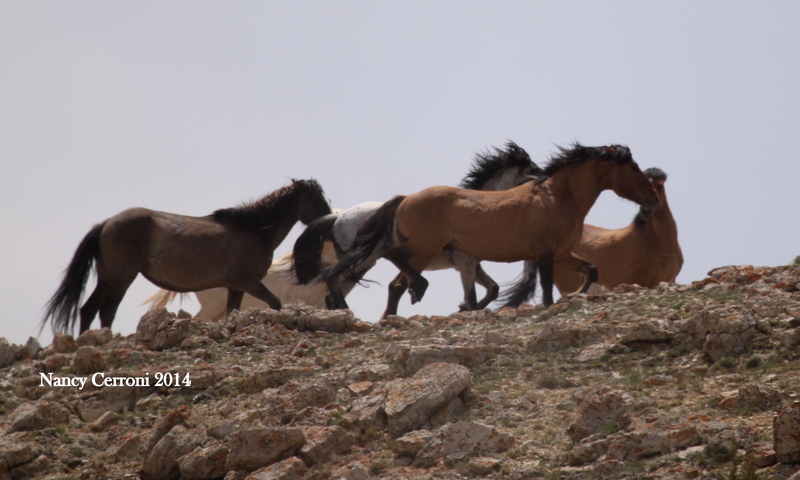 Drawing closer, Cappuccino’s band appeared north of Cloud’s band. 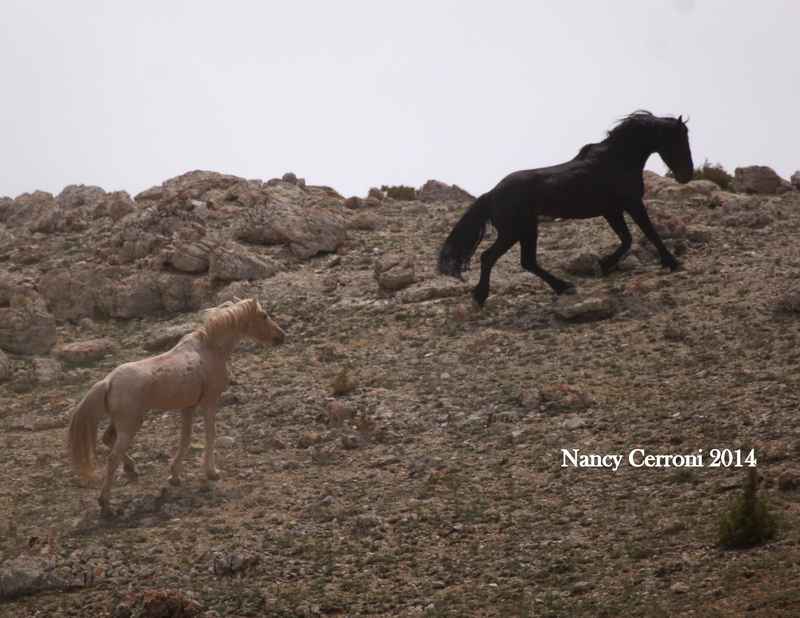 The dark horse and Cappuccino called out and walked towards each other. At this point it became clear that the dark horse was Doc. There was no sign of Demure. 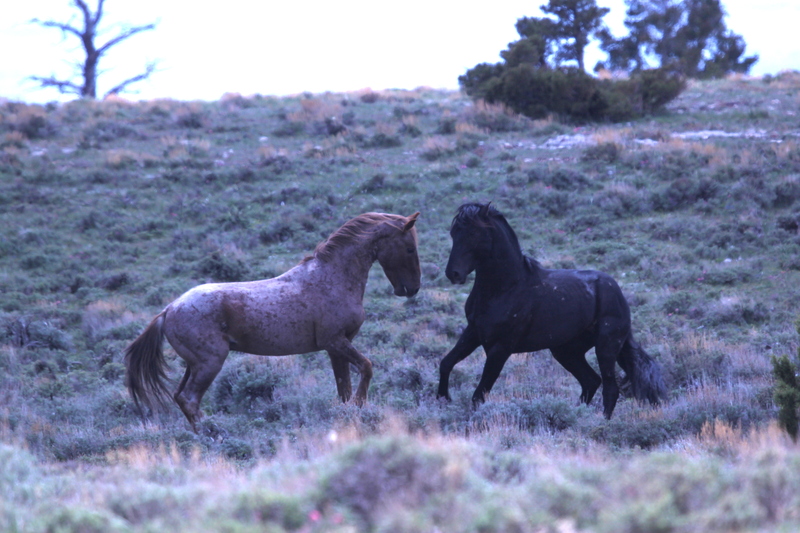 The meeting between the two stallions was brief. There was more noise than action. 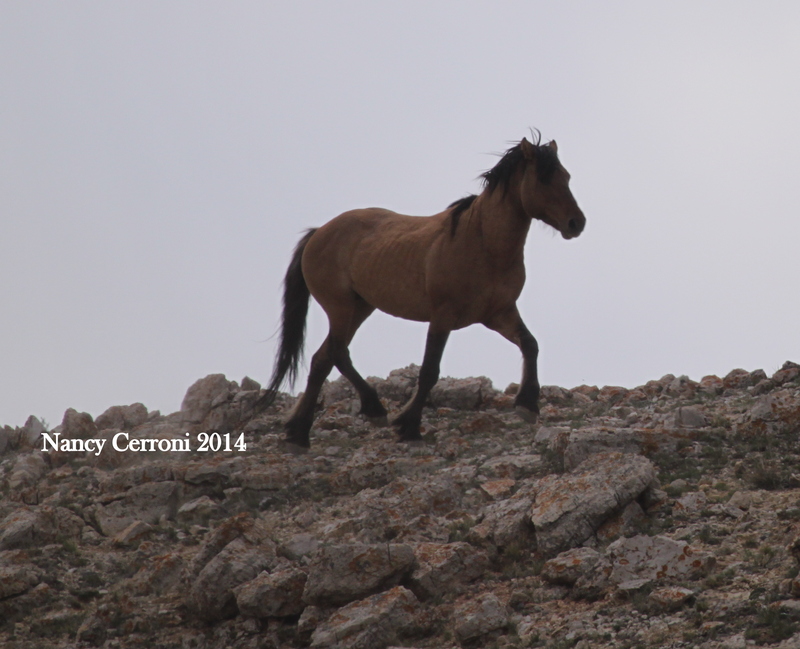 Doc trotted around the bottom of the hill coming closer to Cloud. 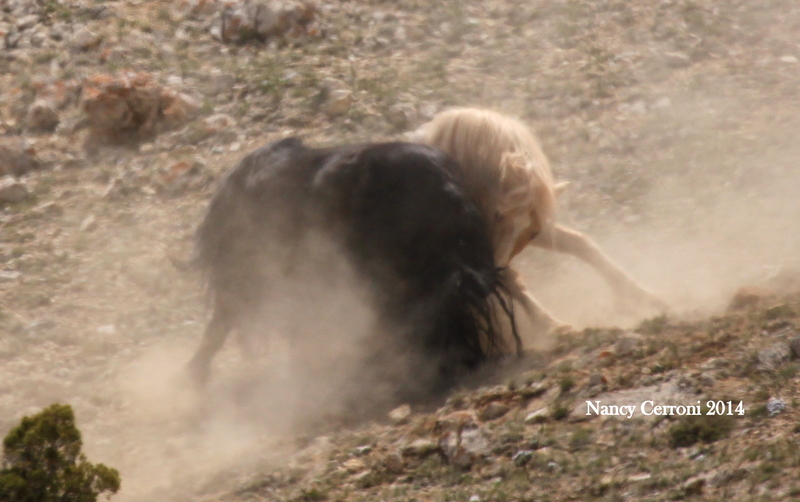 As Cloud gave chase, Doc ran away and circled back up the hill. He did not seem eager to confront Cloud. Cloud returns to his band. Cappuccino continued to hang near Cloud’s band. Mica came down to check him out. There was no aggression on Caps part. Mica showed his respect with the teeth clattering of the young. 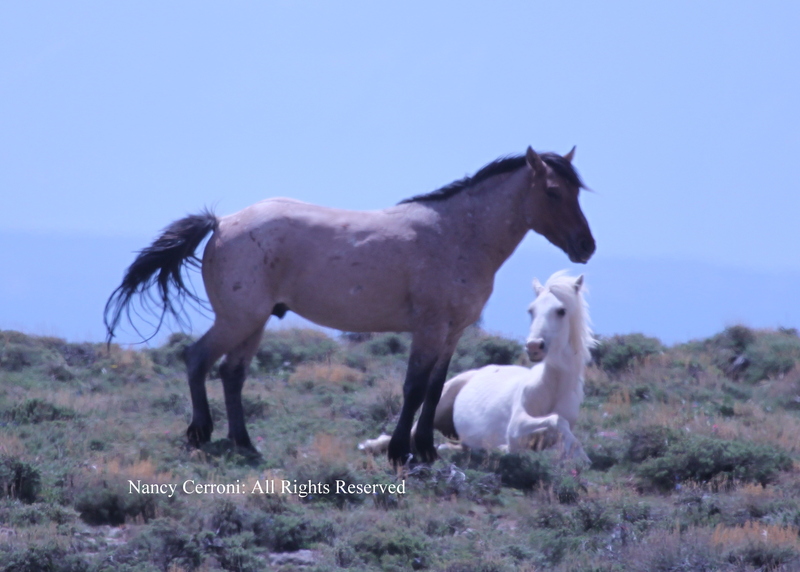 Cappuccino and Mica, Cloud and Feldspar’s 2-year old colt. The two remained together for a period of time until Doc drifted back down for another round of squealing and kicking. Jackson’s band grazed a short distance away. What a large band! 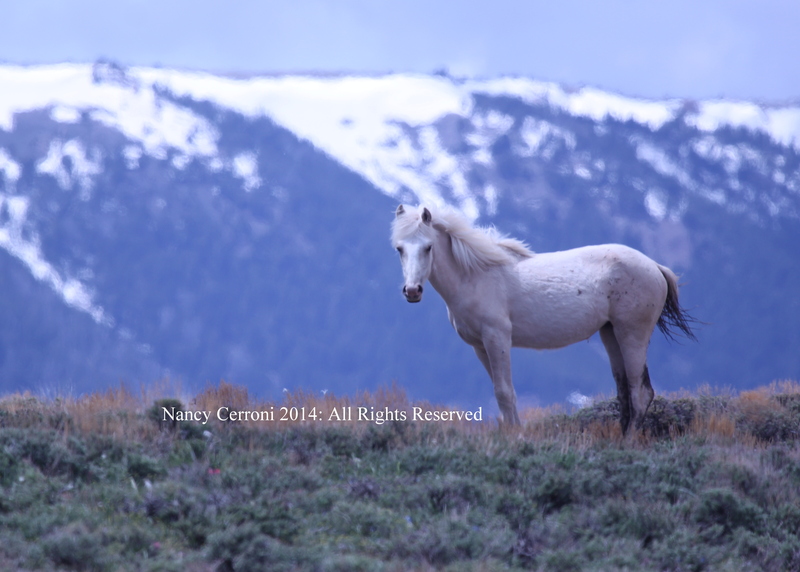 Upon hearing the stallion sounds below him, Jackson trotted out. He stopped, took a look, and then returned to his band and their quiet grazing. Cloud’s band had all moved to the top of the hill. Doc was standing to the west. Cappuccino moved up the hill to the east. He and Mica resumed a brief greeting. Cloud’s band in the center. Cappuccino to the left. Doc (not visible) just to the right. Cloud sensed the pressure on both sides of him. He quickly moved toward Doc. 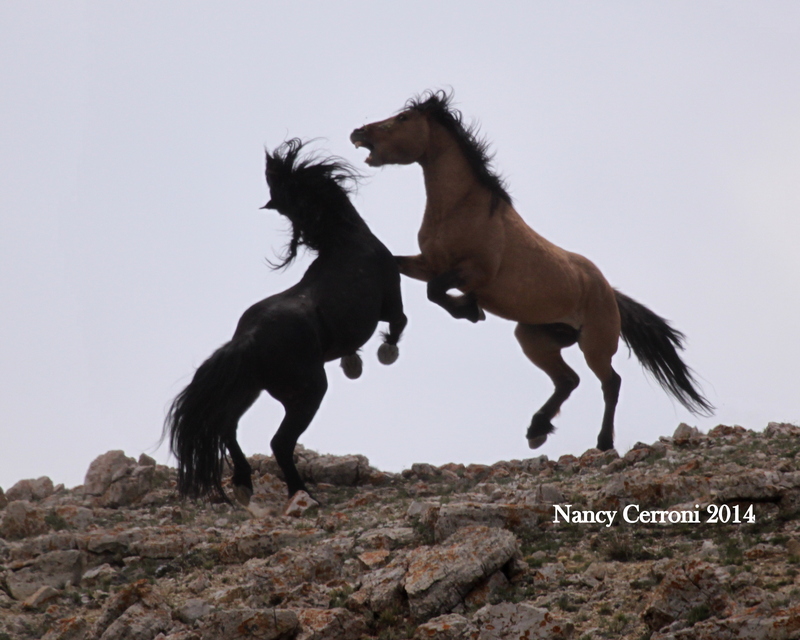 Both stallions headed down the rocky hill. And in an instant they engaged in a battle. It wasn’t the rearing up kind of battle. It was intense; down and low. Doc heads down the hill with Cloud in pursuit. 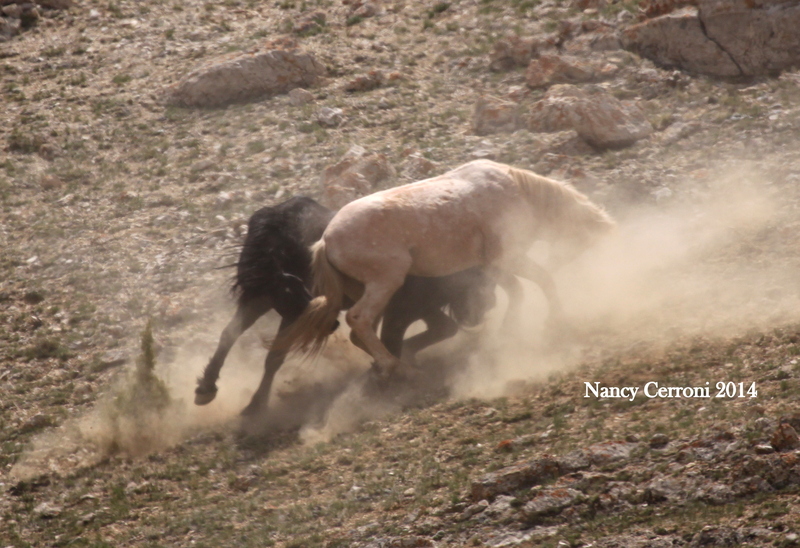 Meanwhile, Cappuccino seized the opportunity and circled around the band of mares Innocentes and Feldspar and Feldspar’s young, Mica and Nimbus. Cappuccino looks as if he might join in the fight. Cappuccino comes around the band. Cap heads the band up over the hill and out of sight. Cloud and Doc continued their battle. This was most definitely a battle of epic proportions. Pictures show the action better than words. It was only halted when Cappuccino came back over the hill. Cappuccino came back over the hill. At that point, Doc went back up the hill with a limping Cloud in pursuit. 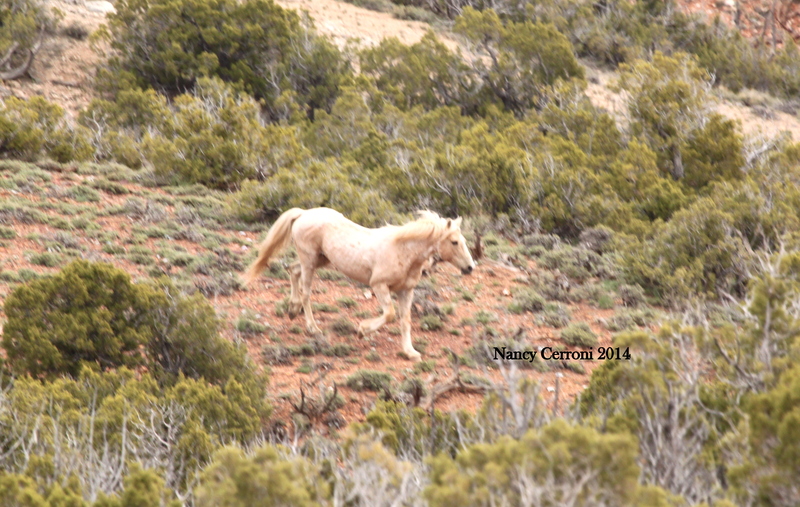 Cloud held his left hind leg off the ground as he ran back up the hill. Cloud and Doc run up the hill. Doc went immediately for Cappuccino. 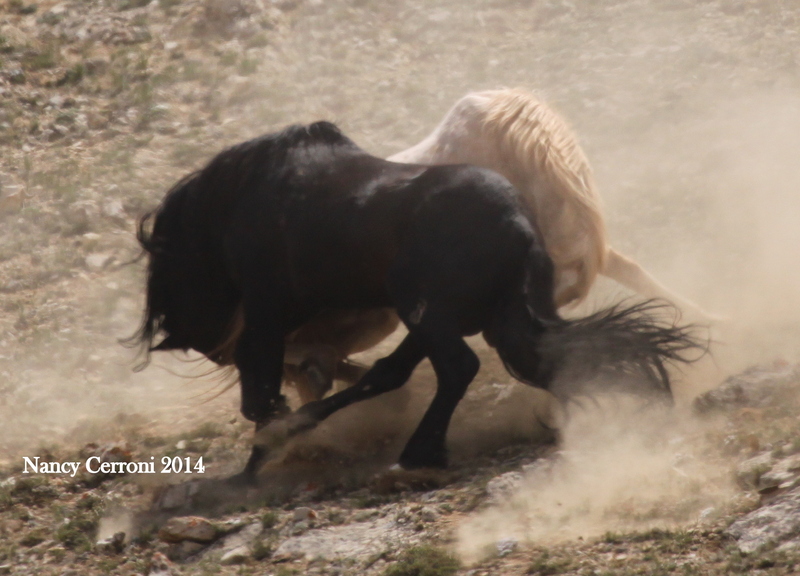 The two young stallions engaged in some aggressive action. Doc ended the action and moved in the direction of Cloud’s band. Cloud and Cappuccino then had a brief altercation which ended when Cloud became aware of Doc’s advancement on the band. Cappuccino ran off towards his band. Looks like there might be more action. Cloud notices Doc with the band. Cloud runs to the rescue. It didn’t take long for Cloud to re-appear with his band. Doc was back to his place of just circling and watching Cloud and his band. And that’s how the afternoon ended. Cloud had managed to hold onto his band one more day. Doc with Cloud and Nimbus. Watching today’s events was emotional. Cloud’s powerful presence on the mountain has been impressive throughout the years. This year he has a new fragility to him. 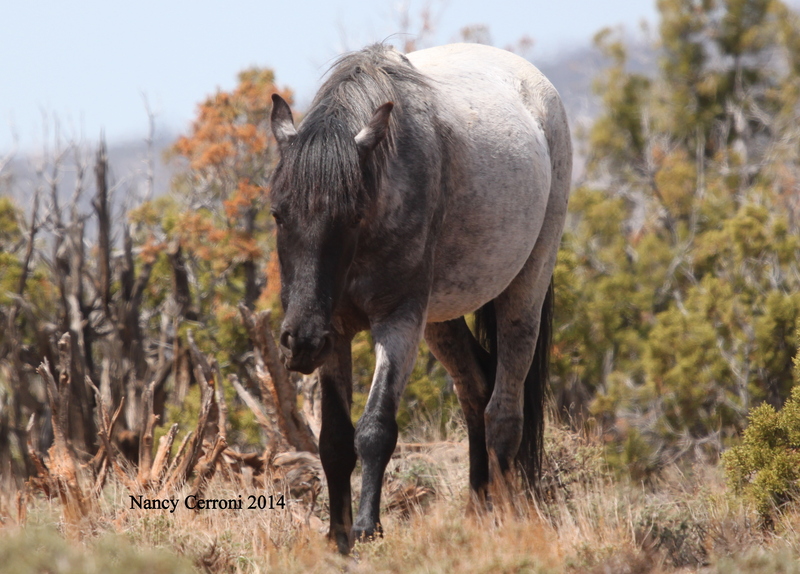 As Joy Vancos said of this event, “This is an integral part of wild horse life on the range.” One day the outcome will be different for Cloud. But we can’t be sad for Cloud. He’s led the perfect Pryor life: a life of freedom in his Pryor Mountain home. 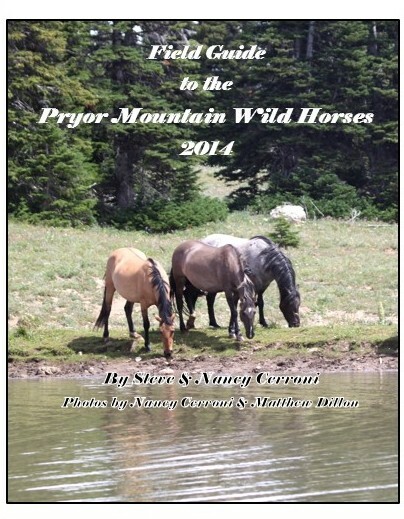 The Mustang Center announces the publication of a Field Guide to the Pryor Mountain Wild Horses 2014! 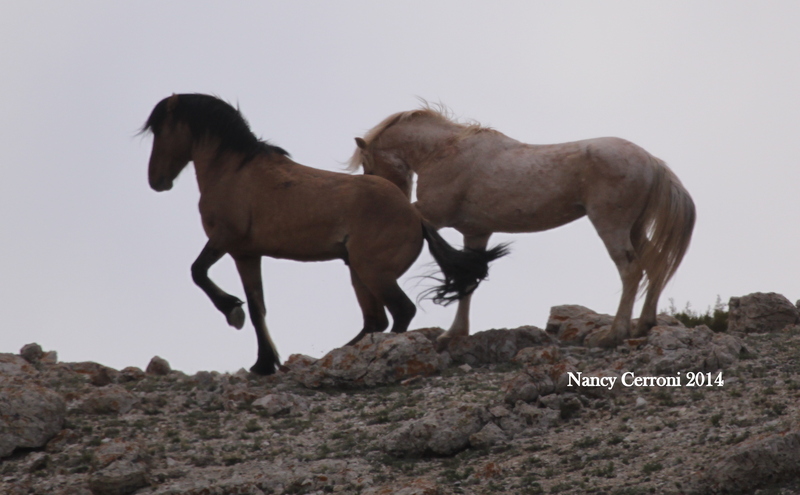 This exciting 44-page reference field guide is now available and will be an excellent resource for anyone interested in the Pryor Mountain Mustangs. 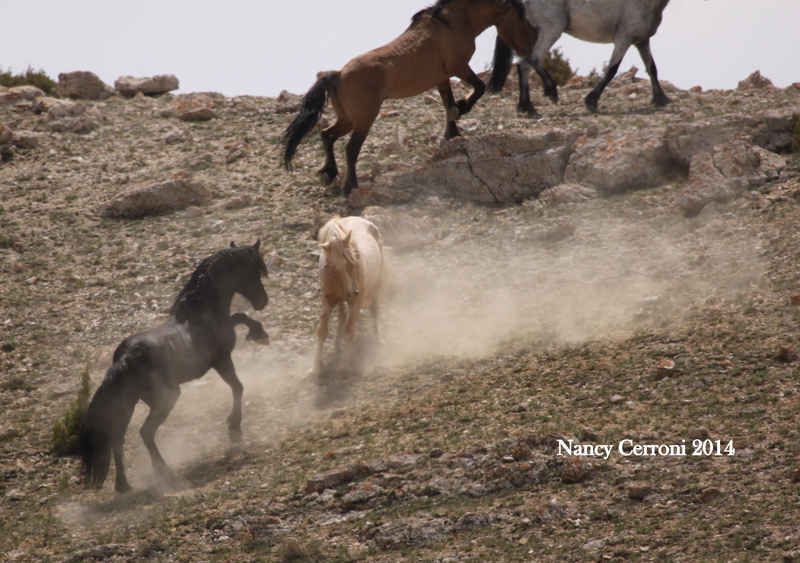 The book includes full-color pictures and descriptions of each and every horse (over the age of one) currently living on the Pryor Mountains. 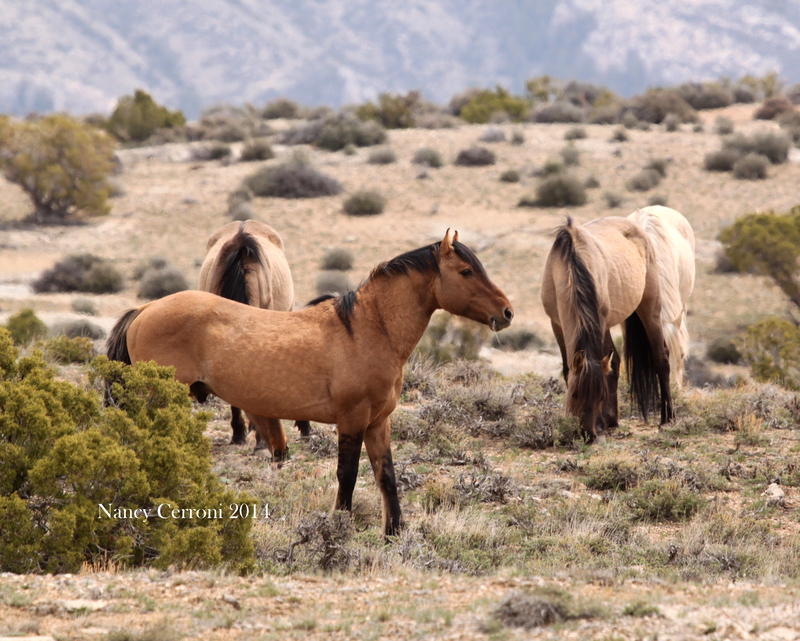 The Field Guide is available for purchase at the Pryor Mountain Wild Mustang Center (on-site or through the website) or through the Lovell Chamber of Commerce.